My fiance and I recently stayed at the Sotiris Apartments and had a fabulous time. The family are great, really friendly and welcoming. The apartments are well maintained and very clean. Kefalonia is a stunning island and I recommend it as a perfect place to go away and just rest. Svoronata is great, and to be honest you don't hear the planes, so although the airport is nearby it's not an issue. For eating out we recommend the Fois restaurant and Spiro Spiros in Svoronata, that's if you want to stay around the apartments. If not and you want to head off somewhere, rather than head off to Lassi, which is just down the road, I definitely recommend Argostoli for a night out, it's a cheap taxi ride and there are plenty of bars and restaurants to go to, plus a good harbour with some impressive yachts. What more can I say than it's great. you can also find us at www.sotirisstudios.gr !! Stayed in Sotiris Apartments earlier this year (May) with my fiance, have to say we absolutley loved the place, and Kefalonia, to bits! Everyone was so friendly and very helpful. We'll definitely be back next year, might even make it our honeymoon! Hi, We will be at the Sotiris in aweeks time, first visit, and what we wanted to know if ther are any money exchanges close by or ATM machines. looking forward to our break. 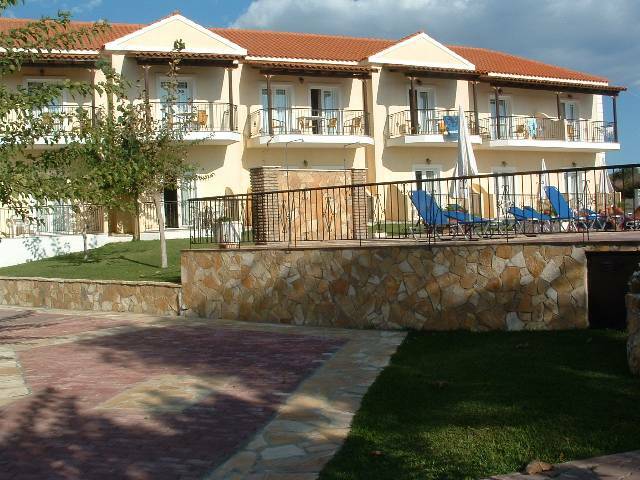 Just returned from ANOTHER relaxing holiday at Sotiris Studios & Apartments. Just got back yesterday form the sotiris apartments. Great for a relaxing holiday although very close to the airport the few planes that flew overhead were a welcome distraction. The family at the soriris are wonderful and go out of there way to make you feel welcome. BBQ night is great and the food is lovley. Would stay at the apartments again. We have stayed at Sotiris many times now and keep coming back because it is run so well by the family who are such lovely people and have been such a help to us in the purchase of a plot of land on the island. So untill i can afford to build my house i will keep coming back to Sotiris. If you want to "get away from it all" you won't get much better than Sotiris. We absolutely loved it - clean, quiet, good food and drink, lovely people and hospitality. We will visit again, for sure. A well run family business. If you are looking for a quiet and relaxing holiday in a very friendy atmosphere then this could be the place for you. Being fairly close to the airport should not put you off as the number of flights are infrequent and do not run into the night.All in all my whole family enjoyed their time there. hi terry + lucas,can you let me know if i can easily get to or from kefalonia in the winter (even if it means flying to england via athens ) because we are definately moving to greece within 18months. A lovely place for a really quiet holiday-no planes at night-fascinating to watch by day! Good beach close by, car essential though if staying for more than a few days or you'll exhaust the local restaurants! We found the best variety of menus in Lassi. Maria, Sotiris & family really friendly and helpful- their B.B.Q. night is great & they cook the best chips on the island! We'll definitely return this is certainly the place for a beautiful, restful holiday - lovely island, lovely people. A lovely family run Apts - perfect for familys. All speaking perfect English as they lived in New York. Owners - Maria and Sortiris - live on site. Very friendly and clean. Any problems dealt with straight away. Only problem was that we had to buy our own toliet paper!!!!! Hardly noticed airport. Mini Market on site with everything you need.